Poplar (Populus): growing, planting, caring. Poplars are traditionally used to drain wetlands or break winds, or to produce timber quickly. Populus is a genus of 25–35 species of deciduous flowering plants in the family Salicaceae, native to most of the Northern Hemisphere. The genus has a large genetic diversity, and can grow from 15–50 m (49–164 ft) tall, with trunks up to 2.5 m (8 ft 2 in) in diameter. The bark on young trees is smooth, white to greenish or dark grey. On old trees, it remains smooth in some species, but becomes rough and deeply fissured in others. The shoots are stout, with the terminal bud present. 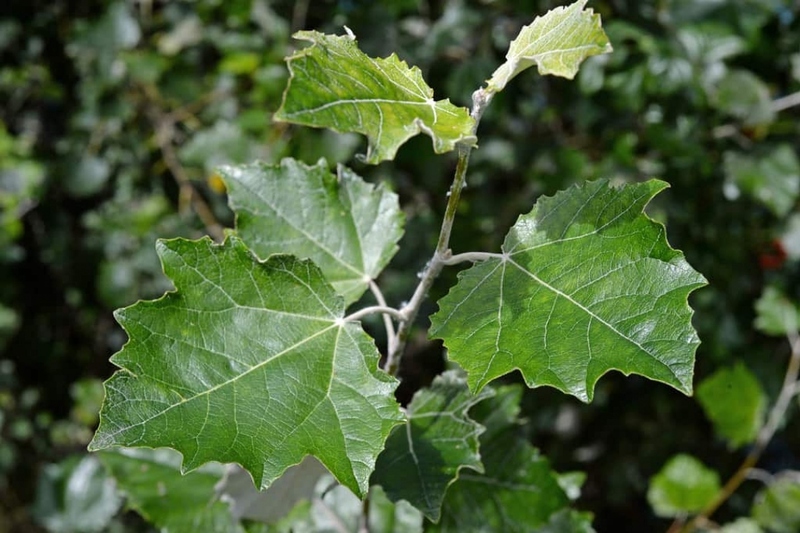 The leaves are spirally arranged, and vary in shape from triangular to circular or even lobed, and with a long petiole - in species in the sections Populus and Aigeiros, the petioles are laterally flattened, so that breezes easily cause the leaves to wobble back and forth, giving the whole tree a "twinkling" appearance in a breeze. Leaf size is very variable even on a single tree, typically with small leaves on side shoots, and very large leaves on strong-growing lead shoots. The leaves often turn bright gold to yellow before they fall during autumn.